The month of November is always a bit different for us. Our Classical Conversations group ends for the semester, it starts looking and feeling like fall, and Thanksgiving and Christmas decorations are everywhere! We usually do school a bit different too. The holidays always make me want to slow down and enjoy life. Sip coffee, roast marshmallows, finish (or finally start) those crafts I’ve put off…. 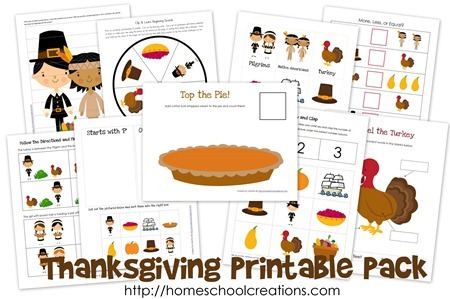 That being said, I thought it would be fun to find some Thanksgiving themed ideas that I can use with my kids this week to help us celebrate Thanksgiving with a little learning mixed in! I scoured the internet looking for a variety of things. I hope that you find something that will work for your family. I haven’t used all of these items, so if you find a problem, broken link, or just have a concern about something, PLEASE let me know! Use the links below (or click on the pictures) to visit these very creative fellow blogs to download the materials. 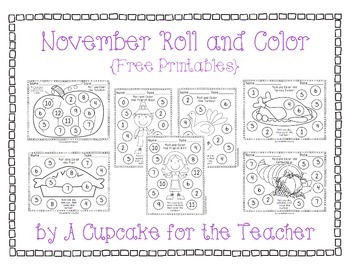 Check out this really cute pack of activities and worksheets from HomeschoolCreations! Jolanthe is amazing and you’ll find tons of other creative and educational resources on her blog! 2. Teachers Pay Teachers is a great site to get downloads. Many items are FREE! This worksheet caught my eye because you can do a lot with it. The directions are to roll to die, add the numbers, then color the correct circle. If you wanted to take it up a notch, you could play other math games with it…multiply, divide, etc. 3. 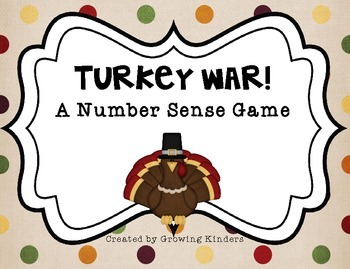 Another great resource from Teachers Pay Teacher is Turkey War – Basically this is a set of playing cards with turkeys on them. However, the numbers on the cards are displayed in different ways (dice, tally marks, ten frames, etc). Great for the little ones, but could also be fun for the big brother or sister too!! 4. Carisa over at 1 + 1 + 1 = 1 blog has loads of really fun and inspiring creations and posts! This one really seemed fun for the little ones! My little guy is only 17 months old, but he LOVES to paint and draw and I’m totally going to do this Q-tip Painting with him this week!! 6. 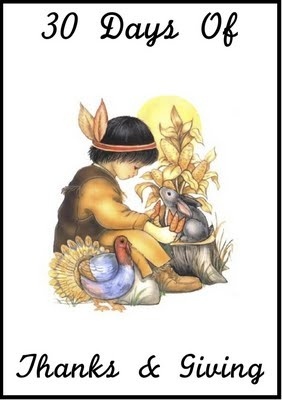 This PDF from Aussie Pumpkin Patch gives a detailed list of 30 activities related to Thanksgiving, Giving Thanks, and more. Great ideas with links to online resources. Great for all ages. I haven’t tried all the links but there are so many to choose from, you’re bound to find plenty to use with your kids!! 7. Remember Mad Libs? The 2 amazing sisters at My Sisters Suitcase created this really cute mad lib. My kids love these, and let’s be honest, I do too! This Thanksgiving themed Mad Lib is fun for all ages! Get the grandparents involved for some family fun. 8. I LOVE this idea from Rachel Wojo! The older kids will have to use the clues hidden in verses to find out what item to find outside! Really, I think older and younger siblings could even play together! 10. And for all the coloring fans out there (kids and adults alike) here is a great place to find FREE adult coloring sheets with fall themes! Kimberly Layton at EverythingEtsy.com is sharing her designs for free!Spend time together with the grandparents while coloring. I’ve found something as simple as coloring will provide a great way to have meaningful conversations! 10. This is an amazing website with a list of online videos for kids. You can search by theme and age/grade. This link will take you to the Thanksgiving category. I have not previewed these videos so please watch at your discretion. I like to take time to do things a little differently near holidays as well. Thanks for sharing these ideas!